I simply love it when my research and reading of some of the gems from Sri Aurobindo's extensive writings lead me to an extra-ordinarily exact and supremely succinct interpretation that helps me make sense of some recent phenomenon or observation which I have been mulling over. It is as if the Master himself was guiding me to that passage. Of course, He is, always. The phenomenon I am speaking today is the drama that is being played out in, or rather outside, the halls of Indian Parliament. The reactionary, ill-intentioned, selfish politics being played by some opposition parties, led by the Congress, as many serious political thinkers have already commented, is nothing but a ploy to disrupt the much-needed economic-political reforms that are critical to put the country back on a growth trajectory. The opposition knows that this drama is the only way to put brakes on a growth and development agenda being pushed by the government. As one seasoned and thoughtful analyst recently wrote: "Sonia Gandhi would rather have India fail than see Modi succeed. Her recent picture gesticulating to the cameras and circulated on the internet tells it all." But let me get back to the heart of the post. 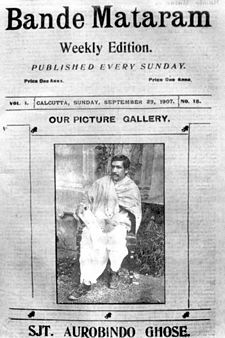 For the last few days, as part of a small personal research project, I have been re-reading some of the political writings of Sri Aurobindo that he did for the nationalist journal, Bande Mataram, during 1906-08. Once again, I have been marveling at his revolutionary fervour, a fervour that is firmly grounded in a penetrating and accurate understanding of the ground realities which existed at the time in the political landscape of the country. It is a fervour that is deeply inspired by the eternal truths that India as a nation has always stood for since times immemorial, truths that he had also realised in his sadhana. Once again, I have been awed by his fiery expression, an expression that is fully soaked in the colour of love for the motherland and the truth for which she lives. It is an expression that has the power to rekindle that deep-seated love we all feel in ourselves for the truth of our nation, despite the outward differences in political leanings and preferred ideologies. The coming weeks and months may see me write a bit more on what I see as some of the most relevant implications for our present-day contexts, emerging from some of these political writings of Sri Aurobindo from more than 100 years ago. But today I wish to share one small passage he wrote in a piece titled "The Vanity of Reaction" published on October 7, 1907. In this piece Sri Aurobindo spoke of the destined failure of all repressive moves that the then British colonial government was making to crush and suppress the growing fire of revolution for India's freedom that was spreading in the country. He even cautioned that such repressive reactionary moves would spread the revolutionary fire even further and bring a shameful end to the colonial power. As I read and then re-read the piece, a part of me kept coming back to the first paragraph. I couldn't help but see how perfectly his words explain the deeper truth of the drama that is being played out outside the Indian parliament. The Parliamentary logjam we have been seeing is a bitter and utterly non-sensical reactionary tactic of the political opposition parties which don't really care for what happens to the nation. Their only interest is to dislodge any move that could open a new path of growth for the country. In a strange way, the following words written more than a hundred years ago, in another context, seem to describe exactly what is going on in the name of the selfish drama of the parliamentary holdup. What is interesting to note is that what Sri Aurobindo wrote for the reactionary absolutism of a foreign colonial power back then holds true for the so-called Indian opposition parties, as if to suggest the lack of the Indian-ness behind their ill-intentioned tactic. What is also interesting (and heartening) to note is that such reactionary absolutism results in only prolonging for a bit the hour of doom for the old institutions and powers, whose end is near and certain. The rational and informed sections of Indian people are no longer fooled by such reactionary and disruptive tactics. And the longer such logjam continues the more the thinking people will be enraged against those sections of political classes that are seen as impeding any meaningful work in the nation's legislature. To read full text of Sri Aurobindo's piece, titled "The Vanity of Reaction" click here. To read previous post in the Current Events, click here. To read all posts in the Current Events, click here. Freedom: What is it for?